Yogananda's Exhortation "Seek God" Is to Mean "Wake up in Selfhood"
Seeking Mother God - All Right? The column to the left below shows how often words are encountered (their frequencies) throughout the whole book when footnotes are kept out of it. The column to the right shows words and word parts. Word distribution tends to reveal patterns - and "break the code" too. There are some comments on the word count below the table. The asterix (*) marks a group of letters that may be found in various words. Thus, Tao* above is found as Tao itself, in Taoism, Taoist and Taoistic. There are no mentions of any of them in Yogananda's Autobiography. Possible Significance, or "What all this could mean"
Master versus Christ - the proportion is about 11:1 in the book. To be spiritual is to be attuned to Spirit, and being authentic ("The one you were to begin with without reading a book") may begin it. For studying the word-frequency table, some hints may come in handy: (a) On top of the table are words that could serve personal submissiveness (near to giving up oneself). (b) In some loosely understood median range we find words used 100-200 times. Such words reflect in part things Americans once hoped to get into. (c) Toward the bottom there could be words that intimate solutions against bossism (authoritarianism) and servility. The words that are used more than, say, thirty times, show marked preferences in presenting things. Interestingly, the author speaks over twenty times more of "gurus" and "masters" than "Christ(s)". For what you listen to or read most often, may settle in the memory by the force of amassed repetitions of impressions. In other words, impressions build up. "Well, if the text spans almost 500 pages, footnotes included, then it signals that a blend of some of these terms can be met with on almost every page throughout: Master, guru, yogi/yoga, God, sri (holy), divine, great, saint, swami (Hindu monk), kriya, Lord - and so on. (See the table). That is what you get on the level of words, in addition to such as the twenty most frequent words in English conversation: a/an, after, again, all, almost, also, always, and, because, before, big, but, can, come, either/or, find, first, for, friend, from . . . Frequent wordings apart from the common brief words in a language, may indicate the profile of the work, and perhaps also some predominant or foremost themes or topics in it, such as "cosmic consciousness". ❋ "Cosmic consciousness" is a tricky term, as the wise goal is beyond concepts of grandeur also. Many words seldom help all, except for countermeasures, perhaps. Seeking and arriving well are two different things. Yogananda gave many sermons and lectures before and aside from his autobiography, which was published with the help of Yogananda secretaries and the SRF main editor. Some Yogananda talks have been singled out for a trilogy published by Self-Realization Fellowship. As a rule, the sermons and talks are not complicated, and parts are impromptu, the publishers tells in the first book of the collected talks and essays, Man's Eternal Quest (1982). ❋ Impromptu speeches may be good for folks where the events took place. How good transfer value such speeches have later and in other places, under other conditions, is hard to generalise about. Could there be anything wrong with exhortations like "seek God"? It depends on how the Yogananda exhortation is understood, and how it is done. Buddha says Nirvana is reached by much fit methods and means and not in other ways, for example. Teaching adequate means and ways matters. If we seek God outside of ourselves, it may be a long, long way, for the universe expands fast. Seeking God like seeking another does not always work, and is quite antagonistic to deep meditation: in deepening meditation we glide past many concepts and also categories toward Self-Realization. Hence, being ourselves functions as a gate to being ourselves better - with probably nicer goings than seeking some dualistic concept, like "You, Mother". More subtile that the subtile, greater than the great, the Self is hidden in the heart. - Katha Upanishad, chap. 2. The bhakti ("devotional") movements in Hinduism are later-comers as compared to yoga - which includes physical, mental, and spiritual practices or disciplines that originated in ancient India, from centuries or more before the common era (BCE). "The Bhakti movement refers to the theistic devotional trend that emerged in medieval Hinduism (Wikipedia, sv. "Bhakti movement"; "Yoga")"
This suggests that there were enlightened yogis before devotional movements grew up - such as Yajnavalkya and lots of others. Piousness may also be called intentness on the reality of the Self (cf. above). * (p. 12)". Thus, a well-founded, strong and polite self-regard is not to be given up, since it can lead into that yogi piousness. On the other hand, external devotion mars too often. And devotion directed to someone else as a part of dualism, may be halting inwards at long last, or it misses the gem hidden deep in one's chest, so to speak, one's own deep Self and Advaita. It is better to put determination to work - not on searching outside oneself - but disclosing what is in the deeps of oneself, beyond the waking state. ❋ Mere talks will not save you from words unless you fall asleep from listening or something. All in all, there is a knack to it. So which Mother figure appeals the most to you? Yogananda: "There are two kinds of seekers: those who are like the baby monkey and those who are like the kitten (Yogananda 1997, 258)." Better be yourself well, and a finder, by fit meditation work. Here is a sign of meditation success: "The paramahansa is like a five year old child," said Ramakrishna (1974:2007). Preserve your Inner Child (A TM term), that side to your nature. As it matures, you should get skilled too. The teachings of Hinduism are very many. Here is one: There is one mother (motherhood) in or behind human mothers. In tantra it is taught that the One Mother (Shakti) has many outlets (goddesses, if you like). You should like your mothers - through a correspondence with your inborn nature. If you are a pitiless, cruel type, maybe Kali is your favourite goddess. Yogananda preferred Kali. Is that telling? Yes. Is cruel Kali OK to you? The original kriya yoga teachings of Lahiri Mahasaya often imply, "Don't degrade yourself to be a dwarfed seeker." One who practices kriya sincerely, has to transcend [go beyond] the expectations of results from doing kriya. - Lahiri Mahasaya [cf. Satyeswarananda 1992b, 12]. Seeker, nothing is apart from the ultimate Self. - Lahiri Mahasaya. [cf. Satyeswarananda 1992b, 17]. He surely says, "Seeker, don't seek." There is a knack to it (below). Yogananda deviated from "dont seek" terribly when he told others to "cry for Divine Mother like crazy, and then she would come, he said. Let us hope she is not out to spank cruelly, for what will you do if that should happen? Resist? We can at times combine counsels from a variety of sources: Before we choose a meditation method or system of methods, we can do ourselves a good turn by seeing which methods come out on top among the researched methods, and thus be informed about which method we may expect help from, based on averages that research findings generally are based on. Further, in between meditations we may measure up changes in our lives, say, every month or two or so. Then, based on changes or trends we get aware of we may tentatively or halfway expect further beneficial results too - provisonally. And then, during meditation sessions we focus on doing our well chosen methods to our ability at any time. We can seek to do that - Seeking is not forbidden. During such sessions, vagrant thoughts and expectations may calmly be replaced by resuming the method as often as we find we have drifted off from the wholehearted practice, and that his how to do it during simple, elegant ◦TM, Transcendental Meditation, the test winner far and wide, according to research findings, that is. Thus, through a fit training perspective, we reach higher ground, clearer outlooks, a synthesis in step with Buddha and TM practice, and without necessarily discounting Lahiri's belittling of expectations if it is understood to apply for seeking outside of yourself (your Self) during kriya-yoga sessions only. In sum, it may not be unfit to expect results from meditation when not meditating, but during meditation it is good to keep at "suitable methods, giving them one's attention" and to such an end try not to let expectations or other thoughts disturb or override the serene mind that meditation could bring (in time, if not yesterday). Frankly, a devotional Yogananda promoted ways of guru submission more than crazy-looking seeking. Still, he often spoke of "seeking God", and exhortations of that sort may work against the higher, finer points of yoga meditation if it is not made clear that the search is going inwards by stages, and that God is the Self. What do you think? It may as well be better to say, Do not seek unwisely, for your own good. And that is how inner progress comes about, according to Lahiri Mahasaya, one of the gurus in the Yogananda line, we are told. Lahiri's counsel is to try to lessen desires by calm breathing [cf. Gt v. 62-64]. The swami served as a professor of law and has published many works by Lahiri Mahasaya, also in English translation. ❋ Yogananda did not succeed markedly in fact-checking about Lahiri Mahasaya, the writer. It may be good to know that the favourite Divine Mother of Yogananda, Kali, is garlanded with human skulls. Yogananda "was devoted to Mother Kali as his Divine Supreme Goddess," writes the Yogananda biographer Dasgupta (2006:26)." She may have a tender side too, as expressed through one of her four hands, even if her dress consists of human limbs. 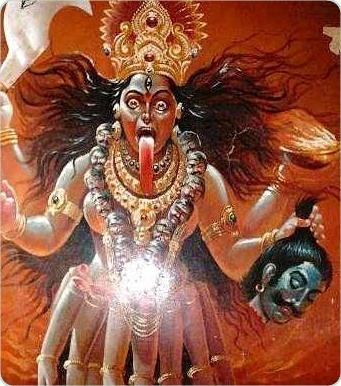 Not everybody takes a liking to Kali according to one's inborn mentality. "A word to the wise, like spice"? "Some women listen neither to reason nor men." Divine Mother as Goddess Kali, was Yogananda's favourite side to God the Mother. Here with bulging breasts and a necklage of skulls, among other things that her iconology gives interpretative clues about. There might be a warning here somewhere. Better take care. Many have not been made aware of such "garlanded ugly skulls" of Yogananda and his teachings. Further, once fished and part of his cult, SRF, they dare not look around to get mature perspectives. That is how it often is, for terms like "guru loyalty" may get in the way. Instead of repeating analogies of monkeys and cats to promote a defective view, Yogananda should have focused on teachings he was sent to the West to spread. His immediate guru, Yukteswar, presented him with a book of theistic Samkhya philosophy teachings to base his teachings on, and he had got kriya yoga methods also. What happened with Yogananda "at large" in the United States, away from India, is that he changed kriya and took to devotional language, and seemingly Christianising it a whole lot. It surely has created problems in addition to the half-ritualised, rather scary "cry for Mother Divine and she will come", and so on. He might have become less bossy than hailing fascism and dictatorship too. ❋ The company you are drawn to may tell something about yourself. If you hunger for fair words from India or if you long for development of deeper parts of your mind or for freedom or more liberation in that way - Yogananda's book goes into such themes, but not adequately. A "submitting attitude" by an expert of submit-and-clinge shines through, and many fattening slogans abound. That seems fair to say. Much talk of God, Masters and sacred fellows does not help a man full well, nor does authoritarian submissiveness training against adequate independence or the non-attachment, disinterest or no-craving (vairagya) that the Bhagavad Gita advocates (6.35; 13.8; 18.52) for all seekers of higher and highest freedom (moksha). Submissiveness tends to hurt personal interests after time; maybe your character - and further development depends largely on your flourishing own interests, according to psychodynamic understanding also (cf. Allport 1966). Now, a rather simple word distribution study can help in suggesting some alarming themes that often escape the attention of many readers initially. There is more on it below. ❋ The total impact of a book consists of value-charged words too, not just quantitative repetitions. The words that are often used can reveal much of interest, but we often have to study the phenomenological "charge" of the words, to be able to say something accurate. Words that are in 'medium' use and moderate use, may reveal a more or less hidden humdrum (of activities) the writing is on top of, yet it depends. Qualitative study has to go into it. Words that are hardly ever made use of, or not at all, may not reflect attitudes in vogue there and then, and they could thus contain liberating and still not outmoded solutions somehow, believe it or not. So from the table on top of the page is it feasible to sniff at some of the author's communicated stances, attitudes, servility problems, sexual strength (bluntness, we presume); position-taking; attitude-formation to gurus and fence-building efforts. What we come up with may not be accurate, but still useful for certain tasks. Much "qualitative research" in these days rest on peculiar strategies and the ability to form one's own opinions. It helps to become good at ascertaining. There are methods to go into for it. ❋ To get good at ascertaining things is feasible for many, as many skills that go together for it, can be learnt and practised. To go to good and adequate sources is part of what may help. "Brag is a good dog ..." (Proverb) - Offhand mentions may be hard to tackle and deal with later. Acclaimed books reflect preferences of acclaimers. Most often terms used in a work reflect ideas and norms that are commonly thought highly of among those it adresses, in this case the public in North America in the 1940s and 50s. The book was written in southern California. One aim of the autobiography was perhaps to inspire acceptance for Indian gurus and yogis by terms like "saints" and "christs" and "holy" and so on. Yogananda goes a long way it the use of such terms. ❋ A well accepted book reflects on its buyers too. Precious independence is fine. It helps us assert such as, "Am meditating already, cannot start now what was started earlier." Or "The eternal now is OK." Hence, we may not be too literal-minded in reading Yogananda. An instigation may be OK, but the good drive should be from inside. That is much as Maharishi Mahesh Yogi stands for. But for the lack of fit indepencence, what if you started to meditate last year and suddenly realise Yogananda's "Now" was somewhere before 5 March 1952, when he died of a heart attack, according to the doctor? Is it too late to catch up with a Now that was Then? Can you manage to obey his seemingly long gone "now!" in a good way? Relax, for Yogananda says the the Now is ever. Man places so much importance on time, but . . . all is a part of the eternal Now. - Yogananda, The Master Said, 1st ed, p. 84. Everything is really happening in an eternal now. - Yogananda, The Master Said, 2nd ed, p. 57. That should not be an excuse for anything, such as not making about the best out of one's life by good regulations, firmness, and developing skills or methods. A problem with series of of appeals, exhortations, and importunities is that they are not conductive to personal development at length. It is quite a "top-dog" thing, too. As means to individual development, exhortations have defects. The early Yogananda tried to persuade persons into it, by giving plausible reasons. Let us concentrate on That from which our being emerges: Know thy soul. - Yogananda, in Jse 200. That is also a bit from his higher teachings, so often drowned in "seek-God" ideations and the like. According to Jung, a developing human becomes more unlike others, more unique, as a result of the process call individuation. Lots of general exhortatations may go against the unfolding of individuality. A spiritual person may not conform to religious cult-like behaviour. The spiritual individual may have to dispense with and also go against blind-folded common beliefs. A truly liberating education had better offers good food for what is essential to nourish, also in the humanistic fields. Liberating self-help education and guru-dictated ways of training oneself and of conforming to a church, for example, may not always go very well together. This is not an attack on religiousness in itself, for it is often rooted in basic friendliness, and can be very useful for tiny sprouts that need some fencing, or for twigs that need lenient enough support. A puzzle is how the author of the Autobiography advocates development through self-effort and self-surrender. Self-effort with skill in accordance with wise teachings is helpful, whereas self-surrender mars the inexperienced that know no yoga methods for it (!) In such a case, better go for being realistic and sensible, for if realism is hurt in an individual, fairness could be the next victim along with truthfulness. What happened to "Pick someone of your own size"? Therefore, try to keep your free will if you can handle it. There is no good reason to give away hard-won, attained autonomy and such assets. Try to have good, clean fun instead, to avoid that things turn ugly. As Yogananda is into, "It is indeed a funny world. But the results of our wrong actions do not seem very funny to us! That is why I quarrel with God (Yogananda 1993, 111)." "Evil destroys all the fun. (Yogananda 1993, 327)" "The whole universe is contained in only a fragment of His being! The Lord seems to be having a lot of fun playing with these marbles in the sky (Yogananda 1997, 55)." "Your outer experiences should be only fun (Yogananda 1992, 241)." Accordingly, being really spiritual is not far from being happy and having lots of fun in savoury ways. Appropriate and gentle humour is good for health too, according to recent research. ❋ Have fun! is a repeated part of Yogananda's message. Yogananda's SRF and other Yogananda disciples do not have a monopoly on kriya yoga. In fact, kriya yoga is described in textbooks of Satyananda, and basic kriya yoga is handed out freely on this site. Some variants are described in Niranjanananda's book Prana and Pranayama (2009). Yoga and meditation have become mainstream in the West since the time of Yogananda Cool, calm practice brings benefits above yakking. ◦Transcendental Meditation is the method that helps the most among the more researched researched methods. Study the research findings to see for yourself. Allport, Gordon. Becoming: Basic Considerations for a Psychology of Personality. New Haven: Yale University Press, 1955. Repr, 1966. Niranjanananda, Swami. 2009. Prana and Pranayama. Munger, Bihar: Yoga Publications Trust. Prabhavananda, Swami, and Christopher Isherwood, trs. 1978. Shankara's Crest-Jewel of Discrimination. 3rd ed. Hollywood: Vedanta Press. Ramakrishna, Paramhansa. Tales and Parables of Sri Ramakrishna. 5th ed. Madras: Ramakrishna Math, 1974. Satyeswarananda, Swami, tr. 1992a. Complete Works of Lahiri Mahasay Vol. I: The Gitas: The Vedic Bibles. Guru Gita. Omkar Gita. Abadhuta Gita. Kabir Gita. 2nd rev. ed. San Diego: The Sanskrit Classics. ⸻, tr. 1992b. Complete Works of Lahiri Mahasay Vol. III: The Upanisads: The Vedic Bibles. San Diego: The Sanskrit Classics. Shankara. 1946. The Crest-Jewel of Wisdom and other writings of Shankaracharya. Tr. Charles Johnston. Covina: Theosophical University Press. ⸻. 1952. The Master Said: A Collection of Paramhansa Yogananda's Sayings and Wise Counsel to Various Disciples. Los Angeles: Self-Realization Fellowship Publishing House. ⸻. 1957. The Master Said: Sayings and Counsel to Disciples by Paramhansa Yogananda. 2nd ed. Los Angeles: Self-Realization Fellowship. ⸻. 1958. Sayings of Yogananda. Los Angeles: Self-Realization Fellowship. ⸻. 1982. Man's Eternal Quest. 2nd ed. Los Angeles: Self-Realization Fellowship. ⸻. 1993. The Divine Romance. New ed. Los Angeles: Self-Realization Fellowship. ⸻. 1997. Journey to Self-realization: Discovering the Gift of the Soul. New ed. Los Angeles: Self-Realization Fellowship.